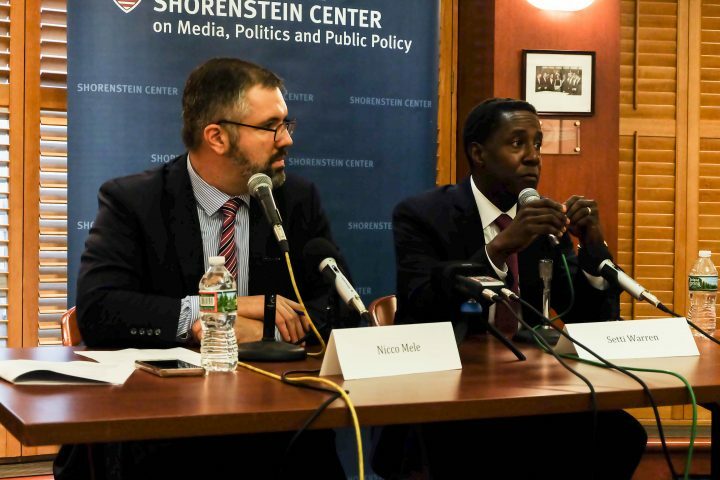 When Setti Warren first took office as mayor of Newton, Massachusetts in 2010, the local paper, the Newton Tab, had an editor, a publisher and two reporters dedicated to covering the mayor’s office. When he left office after his second term in 2018, the paper had lost its editor; its one remaining reporter covered multiple cities. Also during this time, the Boston Globe eliminated its regional editions, including the Globe West, which covered Newton and other parts of the MetroWest region. Warren said he also noticed the hollowing out of the local news landscape when he ran for governor of Massachusetts in 2018, a campaign he dropped before the primary election. As he traveled across the state for his campaign, he found that half the time, there wasn’t a local reporter available to interview him. Nationwide, many local news outlets have shuttered entirely – a March 2018 study published in the Newspaper Research Journal finds that from 2004 to 2015, the U.S. newspaper industry lost over 1,800 print outlets as a result of closures and mergers. As Warren suggested, this portends danger — studies show that areas with fewer local news outlets and declining coverage also have lower levels of civic engagement and voter turnout. Journalist’s Resource spoke with Warren to learn more about his thoughts on the relationship between local government and local news — and how to improve both. Can you speak more to the importance of local news? Can you give an example from your experience as to how local news helped hold you accountable? “The tax package passed … and the Tab really dug in a year or two afterwards to really ask the tough questions. Where is that money being spent? They asked me over and over again. Do you have suggestions for how we could revitalize local news? “Here’s what I do know from my travels across the Commonwealth and certainly in my own city. Ordinary, regular citizens who don’t have access to wealth or social capital actually are interested in understanding what is going on in their community and local government. They’re interested in what their legislators are saying or doing at the state level. We’ve seen in the last two years in particular a wave of activism around particular issues. Whether we’re talking about the [Massachusetts] Safe Communities Act [or] we’re talking about safe gun legislation, we’ve seen a level of activism. “One thought for us to think about on a community-based level is … putting resources together from a community level to pay for essentially a journalist, or two or three. Could we experiment and try to do that? I’m curious about that. I don’t know, I’d like to see some experimentation around that: community-based funding of journalism. Warren explained that politicians’ use of social media can contribute to this “dumbing down” – for example, using social media platforms for attention, or to attack opponents, rather than to discuss substantive, complex matters of policy. How much of this problem of the “dumbing down” is coming from politicians, and how much of it is also coming from the side of a reduced media presence? And also, how much of it relates to the media platforms themselves? “If you’re a journalist right now, you’re trying to cover multiple cities and towns and issues, all in the same day. And if you’re a journalist, you need to get content on your website. At the same time, your capacity to dig down deep into these rather difficult policy issues at the local level is really challenging, right? “Plus, the conflation of social media and how people are using this has brought us to where we are. “The [Boston] Globe, for example, did the Spotlight series on black people in Boston — excellent, and I salute the Globe for putting real resources into that. One of the things it revealed …[was] the net worth of the average black household in Boston is $8 versus the white household is close to $250,000. That’s a real data point and disparity. “Let’s figure out how to expand those types of series, not just around race, but around some of these other complex issues. How do we do it? We’re going to have to come up with business models that allow for funding of that, from nonprofit sources, private sources.